Know your rights: a police officer cannot just tell you to leave public area. It can ask you to do so only if you are breaking the law (e.g. you are disrupting traffic, or entering a private property without permission). Otherwise the police officer is breaking the law, and the the order is illegal. So, nicely point out that there is are no signs forbidding parking and refuse to leave. If you are not black they might not shot you. Is the sign missing or are the cops just ignoring them? A few years ago someone took down the sign and caused a lot of problems because there was nothing to point that said we could park so the police would clear the area occasionally at will. One of them told me that parking has never been allowed which we know is not true. To help get the sign back I met a couple of times with then captain of the Bayview Police Raj Vaswani. I also contacted the City supervisor of the district Malia Cohen as well as my district supervisor. Malia Cohen was helpful in helping me contact the San Francisco MTA. After several phone calls the MTA said they would look into it. I was unsuccessful in getting a parking map that shows the zoning of parking along the road. The MTA as well as the police said they could not provide with one. I also contacted the City, Steve Musillami at Candlestick point SRA and a police officer I knew on the force. Policer captain Raj Vaswani was helpful with our problem. I don’t think he would mind if included the contents of one our email threads. After about six months when it looked like I was getting nowhere fast I saw a city worker installing a sign. I thought I have video of it but I couldn’t find it. I do have a picture of Dan pointing at the sign on or about the day it was installed. I mention all this in case we to need start the process again. In any case I believe we have enough evidence to counter the idea that parking has never been allowed. Quick question, so you guys have an official club or a windsurfer association sticker, how would my officers know if cars belong to your organization? We don’t have an official club or an association sticker. Some of our cars and vans can be recognized by our roof racks and cargo boxes and we tend to congregate along the windsurf launch adjacent to the wooden bridge near the water. There is no certain way to know if a car belongs to a windsurfer. Would it be helpful to identify our cars as such? As I mentioned it’s my hope that we could review the area for legal parking for everyone. Perhaps designated legal until dark if parking at night is a problem. Immediately we could get the missing sign designating existing legal parking replaced. Without legal parking there is no car access to Candlestick park and recreation facilities after five o’clock or on Thursdays and Fridays when the State Park parking lot is closed. The off-road parking area along the straightaway on Jamestown is amply wide and does not impede traffic . I do see the need for no parking along the curved areas of the roadway on Jamestown where the road is not adequately wide. 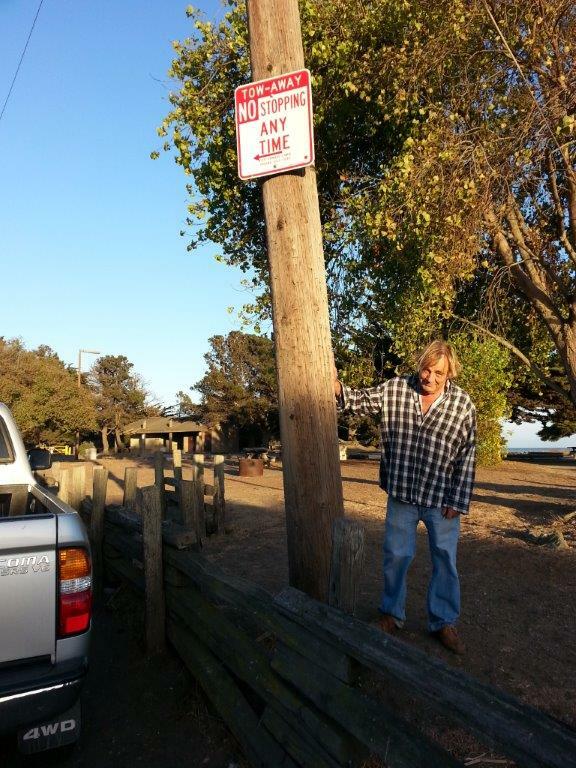 As I mentioned I have been windsurfing at Candlestick since 1988, and its seems that the genesis of the no parking signs near the state park originated about the same time the park started charging an entrance/parking fee. The park did not charge for parking when it first opened and that fee only existed for a few years and was removed except for game days and special events. The signs however remained, a leftover of an earlier time. No parking for games days and special events are now posted as needed. We respect special event postings and with no stadium there are no more game day requirements. SFMTA submitted a request for review to the department of traffic engineering for me. It is request #4683430 but I have not received a response from them. Please let me know if you need additional information or if there is any way I can be of further assistance in this matter. Thanks very much again for your attention. I write today because a half hour ago several of us wanted to go windsurfing when a patrol car came by telling us that the whole area is marked no parking no stopping. Along with everyone there we left. However as I've shown in the past not all of the area is off limits to parking. It would seem that if a sign that says no parking to the right of the sign it would also mean you could park to the left of the sign and be legally parked. The sign showing no parking to the right is still there but was corresponding no parking to the left was removed by somebody. Missing sign or not I would expect the zoning to be the remain the same. I've asked one of the patrol officers about this and they said to their knowledge there has never been any parking allowed. Clearly this hasn't been the case for the areas between the signs. In the past when tickets given they were only for areas outside of the designated parking areas. I was wondering if you could check your parking zoning books and let us know if I'm correct or if the parking zones have changed and we are just not aware of them. If they haven't changed could you provide me with documentation so I can let the officers know when they come by. The area we usually park in is marked no parking but if we have walk some more we will. Also if the parking regulations remain the same could you contact the department of traffic to have the missing sign replaced so we're all clear about legal/illegal parking. Without street parking at candlestick point there is access to the public recreation areas when the state park is closed. Thank you very much for you help in matter.